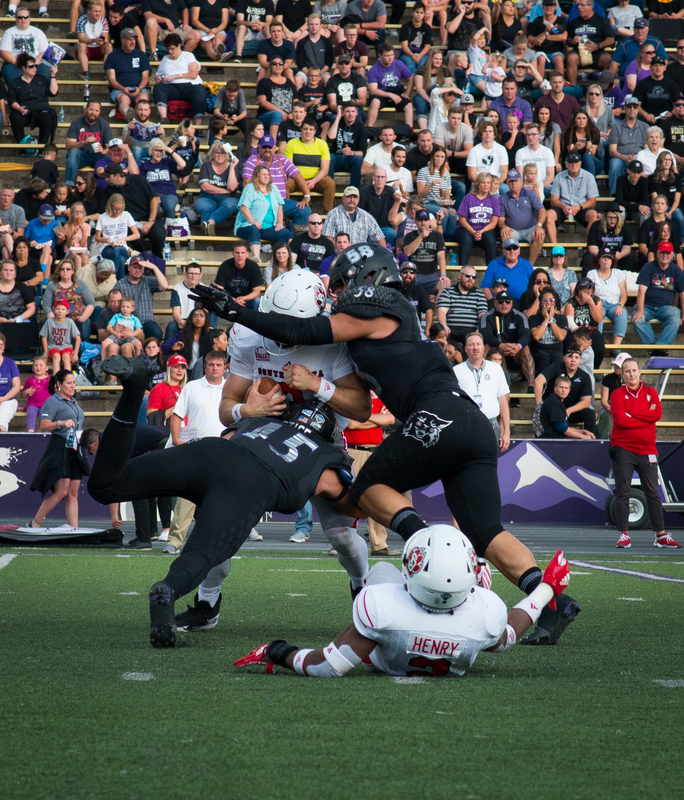 After two straight weeks of being on the road, the Weber State University Wildcats returned to Stewart Stadium on Sept. 15 to host an FCS top-25 bout with the University of South Dakota Coyotes. The No. 22 Coyotes were no match for the No. 11 Wildcats, who prevailed 27–10 in their home opener in front of 8,455 fans. The ’Cats emerged from the locker room donning all-black, a uniform combo featured on ESPN’s Gear Up on SportsCenter and matched by all the fans in WSU’s student section, the Destruction Zone. 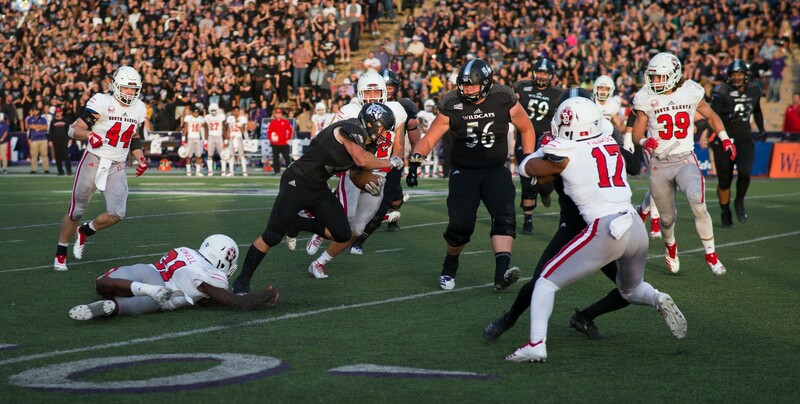 Sophomore quarterback Jake Constantine earned his first start as a Wildcat after an efficient second half against Cal Poly on Sept. 8. Constantine completed 15 passes in 27 attempts for 140 yards, threw a touchdown pass and did not commit a turnover. WSU took a quick 3–0 lead on a 43-yard field goal by sophomore kicker Trey Tuttle before defense took over. A crushing hit from senior safety Jawian Harrison Jr. on sophomore tight end Brett Samson stalled any momentum on South Dakota’s second drive, leading to a three and out. On the next Coyote drive, senior cornerback Parker Preator blitzed junior quarterback Austin Simmons, forcing him to fumble. Senior defensive lineman Landon Stice scooped up the ball and ran it in for a touchdown. The Wildcats opted for a trick play 2-point conversion. Freshman defensive end McKade Mitton made his first offensive appearance in 2018 a memorable one, scoring on a direct snap to push the lead to 11–0. South Dakota began the second quarter in the red zone but was stuffed and forced to kick a field goal, which they converted to cut the Wildcat lead to 11–3. During a slow-moving second quarter, the Wildcats secured themselves another turnover. Senior cornerback Keilan Benjamin picked up an interception to set up another scoring opportunity for his team. 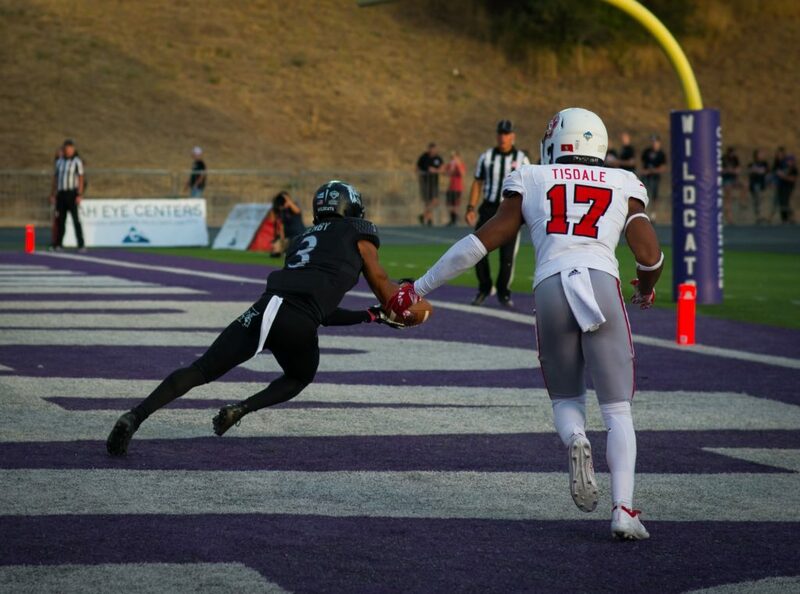 After the takeaway, Constantine connected with senior wide receiver Darryl Denby in the end zone from five yards out and pushed the WSU lead to 18–3 with four minutes left in the half. The Wildcats forced South Dakota to punt on the next drive, another three and out. Davis returned the kick 54 yards, but the momentum stalled. The Wildcats got as close as the three yard line but could not convert on fourth and goal. The first half came to an end with WSU leading 18–3, dominating in all three phases of the game. The ’Cats saw production from their offense, defense and special teams to gift them a 15 point lead at the break. Both teams came out of the intermission stagnant with a lull in the action for most of the third quarter. Tuttle did connect on another field goal, this time from 18 yards out to give the Wildcats 21–3 lead. Early in the fourth quarter, Stice delivered again. He picked off Simmons’ pass and returned it 28 yards into South Dakota territory. 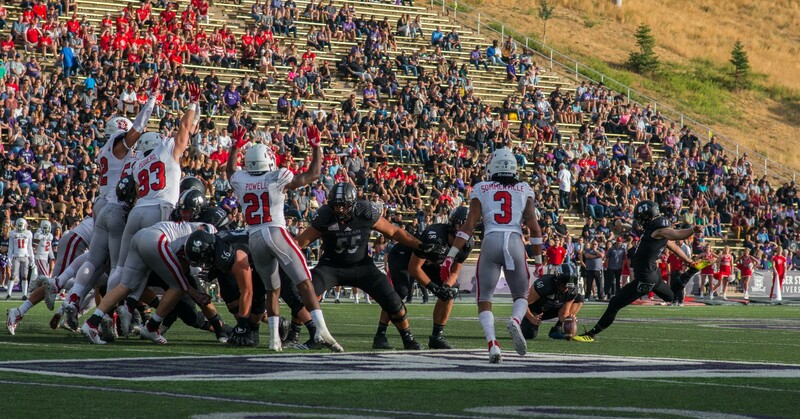 The Stansbury Park, Utah, native ended the night with a fumble recovery for a touchdown and an interception, giving him a total of three turnovers on the season. 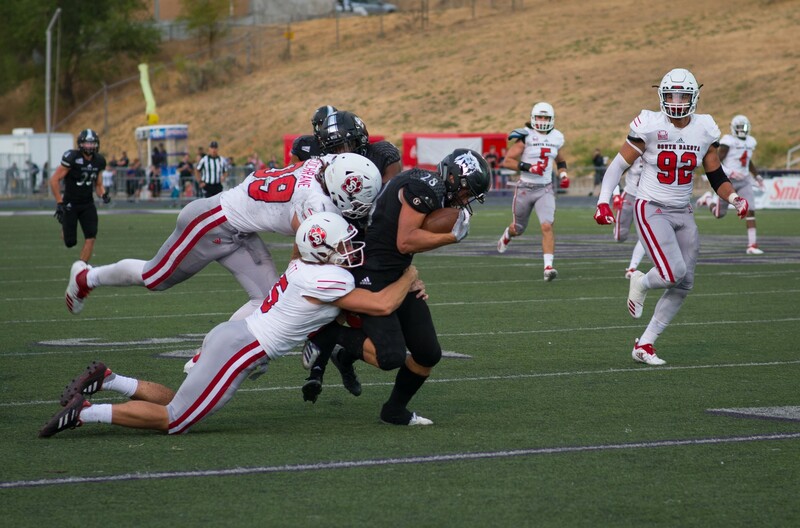 His efforts earned him Big Sky Conference defensive player of the week. “I’m the luckiest guy on this team,” Stice said. The turnover created another scoring opportunity, and Tuttle knocked in a 39-yard field goal. Five minutes later, the ’Cats kicker made it four for five on the evening by adding a kick from 20 yards out. Tuttle’s four successful attempts was the second most in Weber State history (Scott Shields connected on all five tries against Northern Arizona in 1997). The Wildcats led 27–3 after Tuttle’s kicks. After unsuccessfully trying for three hours, the Coyotes found the end zone in garbage time with ten seconds remaining, making the score 27–10, the final tally. WSU head Coach Jay Hill praised his defense for their effort. “We had eight sacks and three turnovers, and that was huge,” Hill said. 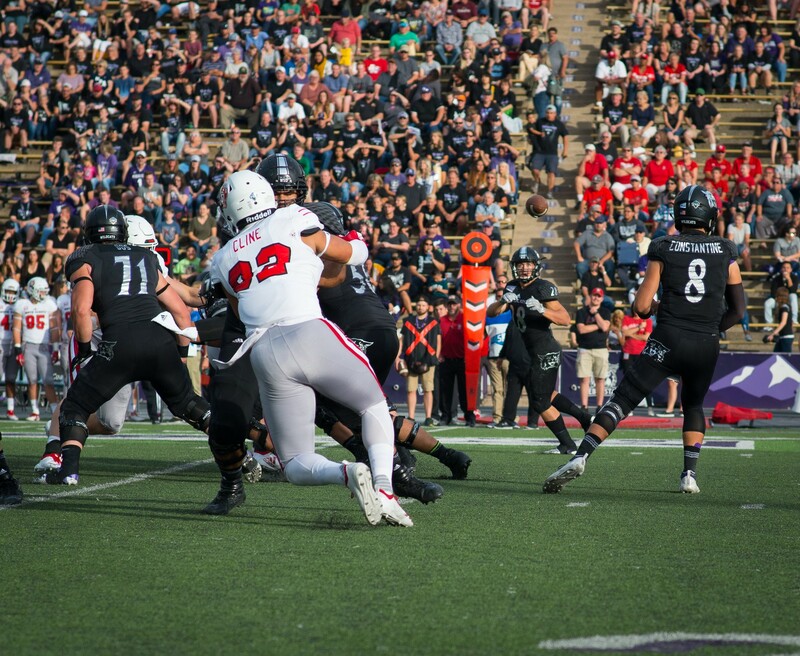 The ’Cats improved their record to 2–1, and they aim to continue their momentum on Sept. 22. when Weber State hosts the University of Northern Colorado Bears, who are looking for their first win of the season.